EDIT: Giveaway is officially over. Congratulations to Wanda Bergman for submitting the randomly chosen 732nd entry. I find it hard to fathom that in just a few days, Ogre and I will be married for an entire year! Even if I had a time machine, I wouldn't change a thing about our pirate wedding. Except to have worn a piece of Talila's vintage-inspired jewelry. She has several bridal lace bracelets and keepsake garters that would have matched my Victorian bustle gown rather splendidly. But it's not too late for the other brides out there! Or any other lady that wants to look elegant on any given day. 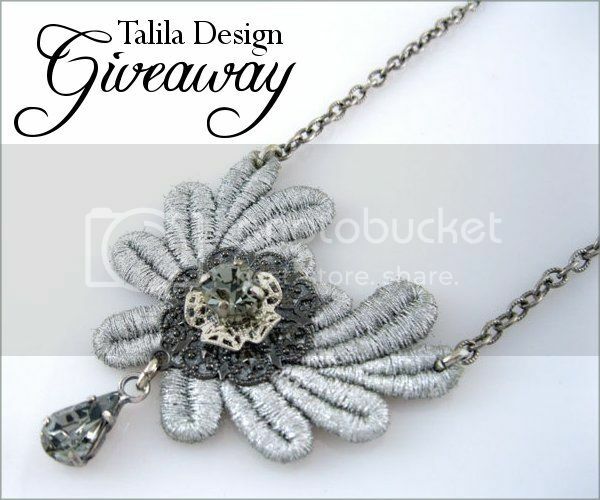 Talila's giving away the gorgeous gray lace necklace above. The lace pendant features a silver flower element with Swarovski Crystal inset and matching tear drop crystal dangle on a silver plated chain. Use the Rafflecopter below to enter to win jewelry sweepstakes before 11:59pm EST on October 5, 2013. Be sure to leave the mandatory comment on the blog post with the same name you use to fill out the Rafflecopter - all entries by winner must be easily verified or a new winner will be chosen. Not including usernames when asked will also get you disqualified. The wedding hair comb is stunning! My favorite item is this: bridal lace cuffs, Grey & Gold Lace, Romantic, Vintage, free shipping ,TalilaDesign Delicate bridal lace cuffs grey with gold c00202. I can't get enough of those cuffs! Bridal Necklace,Gold plated Cream and Pearls,Necklace,Wedding Bridal Jewelry,Victorian,Cream, Vintage Inspired Jewelry NG001 is my favorite! So beautiful! omg it is definitely the "ready to ship," citrine bracelet,gorgeous! And while I'm not entirely sure why it is named such - but I just love the "Wedding Bracelet" - I think Talila used to hace a similar necklace in more of a pink tone - I adored that one too! I love the Bridal Necklace,Gold plated Cream and Pearls,Necklace,Wedding Bridal Jewelry,Victorian,Cream, Vintage Inspired Jewelry NG001 :). thank you so much for another giveaway! It was hard to choose because everything is beautiful. I really like the black lace bracelet. My favorite is the Mother of the Bride gold and brass plated Necklace. Not just for weddings me thinks! Beautiful! I love the 'Christmas earrings'- they look so amazing! Love the Bridal Necklace,Gold plated Turquoise and Ruby Necklace,Wedding Bridal Jewelry,Victorian,RED, Vintage Inspired Jewelry-NG009...very pretty colors! I love the silver bridal sash with the crystal and pearl accents/pendant, and the gold plated, victorian inspired bridal necklace, with the white rose at the center. I love the Christmas Necklace! So pretty! I like the silver lace bracelet. The wedding hair comb is my favourite. I like the black lace bracelet. I like the Silver Lace Jewelry Necklace,gothic,Victorian- Vintage Inspired Jewelry,vintage lace,Romantic Bride,Statement Necklace -necklace - NS00202. I really fell in love with the shiny silver bridesmaid belt-B0200. So delicate. So pretty. I love Victorian,Vintage Inspired ,Statement Necklace- NB010 ;looks gorgeous. I love the Silver Lace Jewelry Necklace. I love the crystal heart necklace. i'm loving the Silver Lace Jewelry ! Such a cute Gothic type necklace! i really love the Bridal Jewelry, Wedding Jewelry, beaded bracelet ,Statement bracelet ,Jade Stone,Statement bracelet,lace bracelet, BG00803. I love the Burgundy Lace Bracelets. Beautiful! Christmas Green Lace Bracelets Jewelry,crochet ,Victorian,Free Shipping, Vintage Inspired Jewelry,Romantic,Statement bracelet - BG00819 is the item I most like Jennifer I.
I'm getting married in a few months and I'd be happy to wear this garter! absolutely love the Bridal Jewelry, Wedding Jewelry, beaded bracelet ,Statement bracelet ,Jade Stone,Statement bracelet,lace bracelet, BG00803. Shari - I like the Bridal Necklace,Gold plated Necklace,Wedding Bridal Jewelry,Victorian,Lilac, Vintage Inspired Jewelry E08. I love all the bridal belt sashes! I like the Bridal Necklace,gold ,purpel plated necklace,Wedding Bridal Jewelry,Victorian, Vintage Inspired JewelryNG002.